I’m participating in The Kitchen Cure. I’ll track my progress here, and in this flickr set of before and after photos. Today’s assignment was to consider any new purchases of appliances, gadgets and kitchen tools.Yesterday was a busy day full of fun things, and in the end I didn’t have time to do anything for the cure, and that was fine. 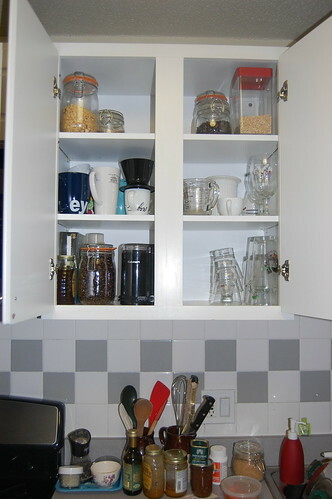 Today I finished cleaning and decluttering the remaining four cabinets! I think this only took about 45 minutes. I really didn’t want to do anything, but I forced myself to start on one, and as I suspected my momentum carried me through. I hit the cabinets with plates, bowls and glasses, and then did the cabinet with the trash can and the one under the sink, which were super dirty and are now somewhat cleaner. The cabinet with the plates looks pretty much the same. I do want to get a little shelf thing to stack some of the dishes, though. The glasses cabinet got rearranged. I pulled a few things I use only rarely into spots that are harder to get to, and rearranged so that the stuff I use most frequently is easy to get to. This freed up some room in there, which is good as I have some new glassware coming from a purchase a few weeks ago. I also transferred a few things between containers, so that I can more regularly use one of my really lovely old French canning jars.